Load Testing was the topic at this morning's Los Angeles CTO Forum. Two presenters showed the goods. Apica has their own proprietary tool, which they demonstrated. I thought it was way cool when they picked up nodes to run their server off balloons on a World Map! The tests are then run off these nodes, using their rackspace datacenters. Apica are partners with Rackspace, so they can come in on your project if your using them for your cloud. The other presenter was Andrew Cholakian, a local hacker who also likes Clojure and wrote his product in it. His product is Engulf and you can spin up AWS AMIs as nodes to run your loadtests. Finally, I spent a few minutes plugging the Technology Radar Group. It's a key tool for keeping up with the dizzying pace of technology. TheHackerCIO is far too busy to do without the Technology Radar Group! Between that and Hackathons, they are crucial for keeping current. Slides are here. Today TheHackerCIO is preparing presentations. Tomorrow he'll present on "Your Technology Radar" to a gathering of Chief Technology Officers in Silicon Beach, held monthly at Clearstone Venture Parners. If you're a CTO in the greater LA area, the LA CTO Forum is a great place to learn from colleagues and to get advice about problems or pointers to resources. Technology Radars are an important tool to keep up with Tech. Invented by Martin Fowler of ThoughtWorks, they are produced twice a year. Lots of developers I work with await the latest Radar release with considerable anticipation. Our local Los Angeles Java Users Group has a weekly book club / study group, which sometimes spends a session discussing Radar items. 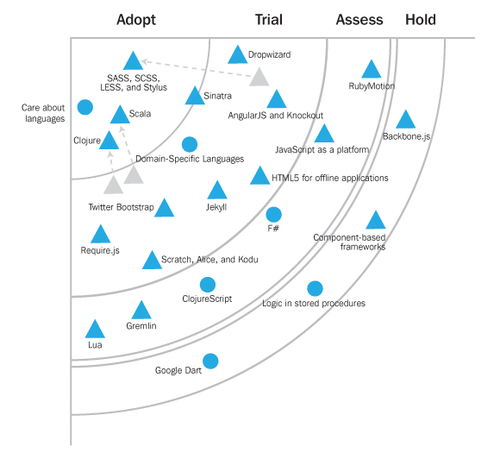 And spend some time reading the May 2013 Technology Radar from ThoughtWorks. 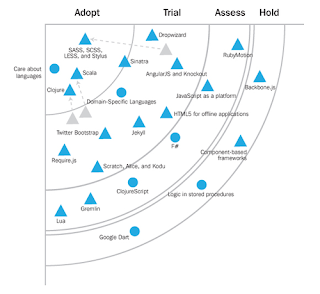 The real point is, you shouldn't be depending on ThoughtWorks Technology Radar. Where is your own personal Radar? You need to be the one actively driving this process of systematic evaluation. To read more about this, read this article and, if you're in LA, join the Technology Radar Group and start working on your own Radar.